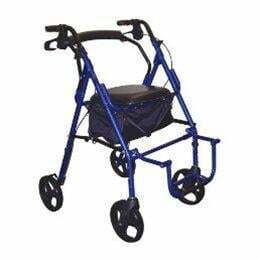 Combines the features of a transport chair and rollator so an individual can ambulate by themselves or be pushed by a caregiver. The two position padded contoured back rest can be attached to the front or the back provides maximum comfort and convenience. Large 8" casters are ideal for indoor and outdoor use. The Duet comes with two sets of spacers to raise or lower the seat height. The foot rest folds down when used as a transport chair and folds up and out of the way when used as a rollator.